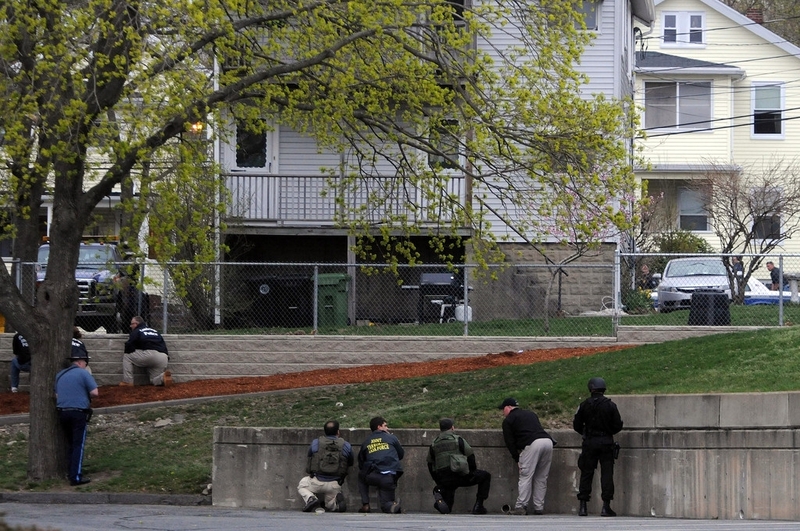 Law enforcement approach an area where a suspect is hiding on Franklin St., on April 19, 2013 in Watertown, Massachusetts. After a car chase and shoot out with police, one suspect in the Boston Marathon bombing, Tamerlan Tsarnaev, 26, was shot and killed by police early morning April 19, and a manhunt is underway for his brother and second suspect, 19-year-old Dzhokhar A. Tsarnaev. The two men are suspects in the bombings at the Boston Marathon on April 15, that killed three people and wounded at least 170. - high-definition photo for free download.